The first question I had when I saw the title of this book was, "What does a casket (which we equate with a coffin) have to do with dancing? Dancing on someone's grave maybe?? Or maybe dancing until the participants drop dead??" So, pulling out the 1861 edition of Webster's Dictionary, I found that he defined casket as "a small chest or box, for jewels or other small articles." Taking a little license then, a casket as used here would be something small, holding a collection of similar items. Confident now that it was safe to proceed, the contents of this book are similar to many of the dance manuals of the time period. 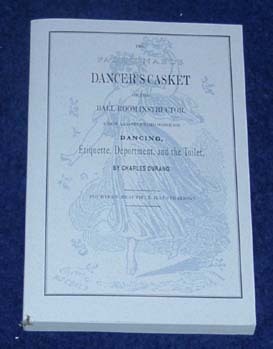 The majority of the book is devoted to the steps of various dances. However, in order for everyone to properly appear at the ballroom and, once there, to excercise proper decorum, there are sections devoted to attire for both ladies and gentlemen and etiquette while present. "... one of the greatest breaches of good manners, that a gentleman can be guilty of in the ball-room, to stand idling whilst ladies are waiting to be asked. He has the appearance of one who is either peevish at a refusal, or too proud and contemptuous to dance with any but his own favorites."